President Bruce opened the meeting by thanking everyone for coming. He then passed the mike around and had the guests introduce themselves and tell where they’re from. We learned that the Seattle (US) Rotary Club (club number 4) was the very first Rotary Club in the world to accept women and that it happened back in 1964! Bruce announced that we had been given some beautiful and large puppets that we will give to our Rotaracts to be given to schools as teaching aides. These were donated by Jillbette Gordon of the Rotary Club of Park City in Utah, US. We know they will love them. US$1,825! We all thanked Treasurer Allan for his hard work on this. We have also been in contact from a Rotary Club in Norway. They have similar focuses on areas as we do and they are very interested in also subsidising the Bali Children’s Foundation’s scholarships. Bruce will keep us up-to-date as this progresses. In addition our club is paying for transportation for 3 Rotaracts to attend a conference in Java! New Members: our club is growing! At the beginning of our Rotary year, 1 July 2016, we had 8 members. 2 of those live permanently in Calif and 2 others resigned within 30 days for various reasons. This left us with 4 members, one of whom is in Australia for 7 months a year. As you can imagine it is VERY difficult to run ANY organization with only 3 people. Well we did and actually with a lot of hard work, we accomplished a lot in this year, fundraisers, several projects, helping our Rotaract club and more. Well these things and other marketing that we’ve been able to do has paid off and as on 1 May we will have 15 members, almost all of which live in Bali year around. Plus we have 4 more that are very interested in joining us soon. Daniel Elber spoke at our club several months ago. He has been a tireless ‘water project’ leader along with our club, for the north side of Bali. Many of his villages that in the past did not have enough water for drinking now have enough to actually grow crops AND they produce products that brings additional revenue to their villages. They grow cashews, rosella, and more. So they have given us some samples that are in the back of the room of cashews, rosella tea and a rosella candy, salt, and more. Plus they gave us several of their catalogs which they also have for beautiful hammocks they make there. So please take some samples and a catalog and really help them by placing orders that will be delivered to you. Bruce also mentioned some information of the projects that our club is supporting: the John Fawcett Foundation for Eye care; Rumah Sehat clinic, which brings medical care to very outlying villages; and our Helmets For Kids project. Also mentioned was two joint projects with the Seminyak Rotary club: a John Fawcett village visit, and a Global Grant (more than US$30,000) for Bumi Sehat, the world famous birthing center here in Ubud. Rtn Terri Lewin then filled us all in with her great fundraising efforts in Australia for the Helmets For Kids project we are involved in. With several fundraising activities, including raffles, she was able to raise A$1800 which will be used to purchase these helmets which cost about A$10 each! She received a large round of applause. Way to go Terri! She spoke to us about Dementia and Alzheimer’s. She said she had over 15 years of caring for her husband so she learned a lot. 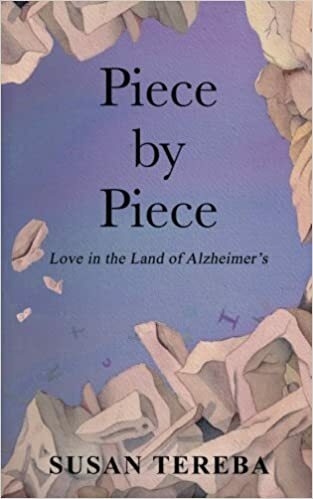 She has written a book about her experience “Piece by Piece: Love in the Land of Alzheimer’s”, which available from Amazon (https://www.amazon.com/Susan-Tereba/e/B01G1G3KYE). If you or a loved one have any of these warning signs, see a doctor (GP) immediately. A Geriatric Neurologist is the expert in this field. She also talked about the difference between memory problems that we all have versus Alzheimer’s. Also was mentioned that Alzheimer’s is a growing problem in the world. In addition she mentioned the difference between Dementia and Alzheimer’s – Dementia is a lighter form of the more serious Alzheimer’s. Alzheimer’s is a TERMINAL disease. Eventually Alzheimer’s leads to death because your brain stops telling your body to swallow food. Susan gave us many sad stories of her husband, Bob’s, decline. To hear real stories made them all the more tragic. She also mentioned a drug that is being tested and may prove to be a life saver – donepezil and memantine. What can we do to decrease our chances of contracting this disease? What tests are there for this disease: Basic questions like, ‘what’s your name’, ‘who is the president’, etc. Are there any places in Bali for these people? Cat Wheeler will be writing an article in the Bali Advertiser soon about this. What is the best way to support someone with this problem? Take a step into the person’s world and join them and be supportive. Remember that most of the time it is the disease talking but that your friend is still down there somewhere and occasionally comes to the surface. Is it hereditary? Yes, many times but not always. Bruce announced our upcoming speakers. He also said we had 3 members birthday this month: Allan, Sue Bennett, and Terri. The meeting was called promptly at 7PM. The speaker agreed to stay late to answer any questions.